Andrew Merrick was whisked from his home in England, 1848, to another time - the very day a mob had attacked his family. Wondering why he remains in this strange place, all he wants is to find the treasure his father had hidden, hoping this might take Andrew back home. But he's running out of time. When he meets a lovely woman in this new century, he feels she is the one who will help him. Halle Chapman has come to England to find her missing father. What she finds instead is a nice man who claims he's from the past. Although she doesn't believe in time-travel, deep in her heart, she knows she must help Andrew. What she finds instead is that discovering the key to her future lies in the past. Now, to return to her own time, she needs to solve the mystery surrounding Andrew Merrick and his family's murder. 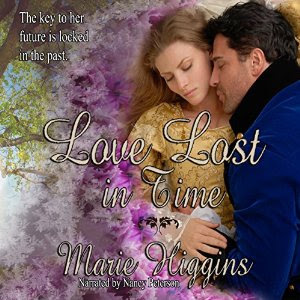 This is a charming time travel romance and it's a little bit different as it involves both characters travelling forward or back at different times. The story primarily takes place in Victorian times and is exciting and full of suspense. Halle's character really appealed to me as she was intelligent, confident and brave. I loved how she dashed to action when the occasion warranted her help. As I listened to the story Halle felt very real to me. I liked Andrew as well but he was more like a fairy tale prince and I think that added to the charm of the story. Their romance was magical and charming and I just loved that. There were so many scenes in this book that I enjoyed but I loved all the suspense filled scenes involving Halle and the family's enemies. The final showdown where the house is attacked is filled with danger and suspense. It had me on the edge of my seat wondering how successful Halle and Andrew were going to be in altering the family's fate. The narrator did a wonderful job of performing the characters and I found it very easy to listen to. She really brought the story to life and I got a great sense of the characters' emotions and feelings through her performance. I thoroughly enjoyed this whole book and I couldn't put it down. I'm looking forward to reading the rest of the series.